The two shortcuts that follow this one take you out of the double pink rollers. To get back to them, hit the [ (left bracket) key. When in Trim Mode and hitting P will change the double pink rollers to a single yellow roller on the A clip (the one of the left of the edit point). Instead of expanding or shrinking the B clip (the one of the right), when you drag this roller left or right or use one of the shortcuts discussed in a moment you’re only affected the A clip. Dragging the roller to the right will expand the clip as long as there is still footage remaining (if a clip is 10 seconds long and only the first 5 seconds are edited onto the timeline you still have 5 more seconds to roll out). Using the yellow roller will expand or shrink the total time of the track. If you have locked tracks everything will move with it like using a Splice-In edit or Extract. When in Trim Mode and you hit ] (right bracket) you’ll get a single yellow roller on the B clip. This works the same as Trim A Side but with the B clip. When you’re in Trim Mode (!!! this is very important that this is only for Trim Mode. I’ll discuss this and the following shortcuts while not in Trim Mode in the next section) hitting . (the period key) will move the roller(s) to the right one frame. If you have the double pink rollers the A side clip will get longer by a frame and the B side clip will get shorter by a frame. If you have a yellow roller on the A side clip then that clip will get longer by a frame. If you have a yellow roller on the B side clip then that clip will get shorter by a frame. Piggybacking on the last shortcut, hitting the / (slash) key will move the roller(s) by 10 frames to the right. Note: This is 10 frames if you are editing at 30fps (frames per second). If you are editing at 24fps then it’s 8 frames. While in Trim Mode hitting , (comma) will move the roller(s) a frame to the left. While in Trim Mode hitting M will move the roller(s) 10 frames to the left. Again, this is 8 frames if you’re in 24fps. Together you want to use M, comma, period and slash to move the roller(s) in Trim Mode. Adding in P, [ and ] to change the rollers only makes you a more powerful editor. If you’re not in Trim Mode already, hitting A will put you in Trim Mode and move the Time Position Indicator backwards to the nearest edit point based on what tracks are selected. If you’re already in Trim Mode then wherever the rollers are you’ll move backwards to the previous edit point based on what tracks are selected. If you’re not in Trim Mode already, hitting S will put you in Trim Mode and move the Time Position Indicator forwards to the nearest edit point based on what tracks are selected. If you’re already in Trim Mode then wherever the rollers are you’ll move forwards to the next edit point based on what tracks are selected. I know a lot of editors that change A and S to Rewind and Fast Forward. This will do the same thing except that doesn’t put you into Trim Mode. For what it’s worth, I have Rewind and Fast Forward set to Up Arrow and Down Arrow and leave A and S as Go to Previous Edit and Go to Next Edit. When you are in Source/Record Mode and not in Trim Mode, be very careful with M, comma, period and slash. They still serve a function and can be dangerous if you aren’t paying attention. Whatever tracks are selected, hitting any of those four keys will perform a Slip (I’m not sure if that’s what Media Composer calls it but that’s what I call it). Your footage doesn’t move in the timeline but the source material does. If there isn’t any more source footage you’ll get a ping/ding/beep sound effect telling you Media Composer can’t do the slip. Hitting M will slip the footage forward 10 frames (or 8 if in 24fps project). Comma will slip it forward 1 frame. Period will slip it backwards 1 frame. And slash will slip it backwards 10 frames (or 8 if in 24fps project). This is actually a bit counter-intuitive but it is what it is. I find this useful but you have to be careful that you’re aware of what tracks are selected and you have to be careful not to accidently hit any of the keys when you’re hitting other shortcuts. 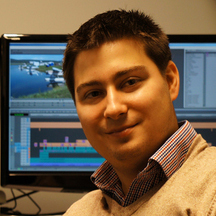 You can easily knock footage out of sync with it’s audio or slip a clip when you don’t mean to. 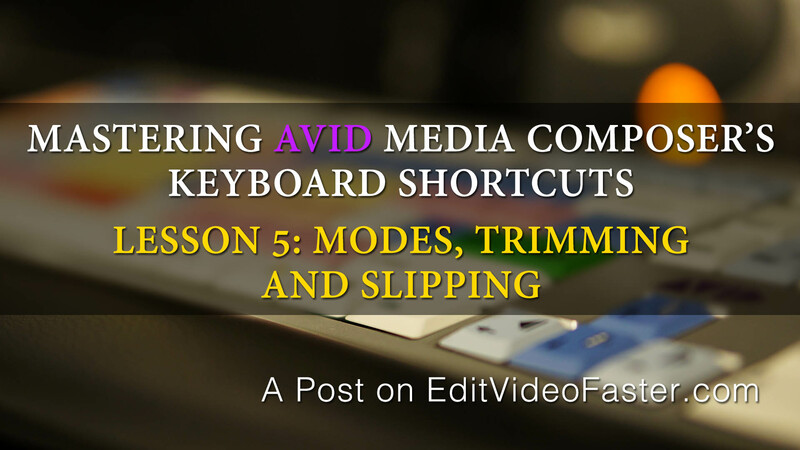 That’s all the shortcuts for Lesson 5 of Mastering Avid Media Composer’s Keyboard Shortcuts. What’d you think? Learn anything new? Ready for Lesson 6? Click here (or the image below) to go to it. PS: If you’re not already signed up to get emails about new posts go to this page! 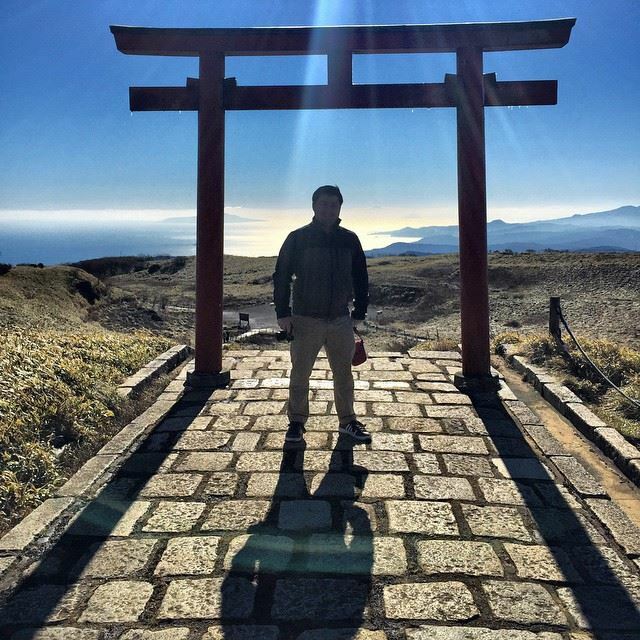 BTW here’s a picture of me in Japan from my adventure earlier this month!